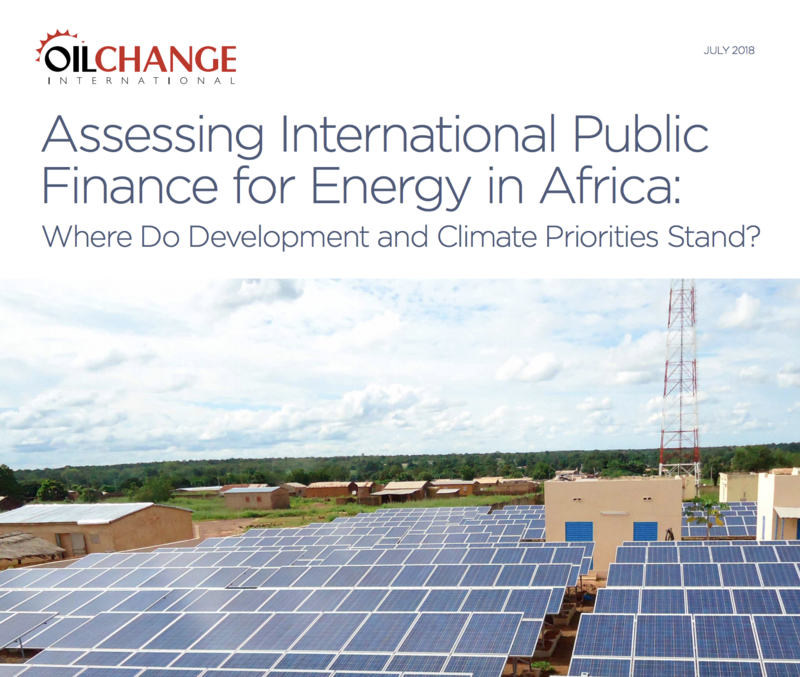 Assessing International Public Finance for Energy in Africa: Where Do Development and Climate Priorities Stand? Nearly 60 percent of public finance for energy in Africa went to fossil fuels – an annual average of USD 11.7 billion. Public finance for oil and gas was nearly eight times greater than public finance for coal-fired power generation. Clean energy projects received 18 percent of public energy finance (not including large hydropower). Roughly one-third of this clean energy finance went to financial intermediaries – including banks, funds, or facilities – to support renewable energy. An estimated 11 percent of public finance for energy in Africa during this three-year period went to support energy access. Less than 2 percent of all public finance for energy in Africa during this period supported distributed renewable energy solutions. Of public finance for fossil fuels, only 4 percent went to support energy access. These proportions are exceedingly small compared to estimates of the level of investment needed to achieve universal energy access by 2030, as enshrined in the UN Sustainable Development Goals. China provided the largest volumes of public finance out of all the institutions and countries considered in this report – averaging about USD 5.1 billion per year out of USD 19.8 billion per year in total public energy finance in Africa. Nearly three-quarters of Chinese finance went toward upstream oil and gas infrastructure, while about 13 percent went toward coal-fired power generation. The Chinese institutions assessed in this report did not appear to finance any renewable energy in Africa over the period assessed, which stands out given the global dominance of China’s wind and solar industries. The World Bank Group (WBG) was the second-largest provider of public finance for energy in Africa by total volume. While the WBG financed mostly fossil fuel infrastructure over this period, its fossil fuel lending is expected to decrease following the bank’s announcement that it will end finance for upstream oil and gas starting in 2019. Public finance flows for energy are unevenly distributed across countries. Three countries – Egypt, Angola, and South Africa – received nearly half of the USD 59.5 billion in total public finance for energy across the continent from 2014 to 2016. Much of the bilateral public finance for energy in Africa supports the commercial interests of the countries providing the finance. In part, this is because a significant volume of the finance assessed in this analysis comes from export credit agencies, which aim to support home-country companies to secure business overseas. 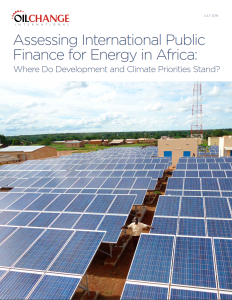 The report concludes by noting that to improve both energy access and resiliency to climate change, public finance should support African countries in a transition to clean energy infrastructure, including distributed renewable systems. This analysis shows that the flows of public energy finance into Africa are currently skewed towards fossil fuel expansion in large economies. A better use of public resources would be to address the urgent climate and development needs across the continent. Furthermore, a majority of bilateral public finance is supporting the commercial interests of the countries providing it. A shift from fossil fuel to clean finance should coincide with a shift toward inclusive growth. Development must also bring more economic opportunities – including leadership and ownership opportunities – for a broader spectrum of the population in African countries.